I stood in the line of nervous parents and excited-though-apprehensive elementary school children at Open House last year. My kids squealed when they saw their friends from last year, waving from our line to others behind us, beside us and in front. After families stepped up to the table to receive their classroom assignment for the year, they walked by us as they headed to the classroom. We asked them, “What teacher did you get?” and then we cheered or compared notes and gave advice. In between greeting other parents and kids, I prayed. Sometimes I mess up and treat God like little more than a pagan idol–acting as if maybe if I cross my fingers, rub a rabbit’s foot, do a fancy jig and offer to sacrifice something, He’ll answer my prayers just because He sees how desperate I am. 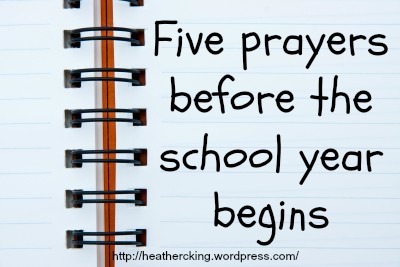 After all, when it was our turn, we stepped up to the table and the principal handed us an index card for each daughter with their room number and teacher’s name for the school year. The decision, however, had been made weeks in advance as teachers met to match students with the right classroom, teacher, and classmates.